Have a sweet tooth and cannot resist having sweets and desserts? 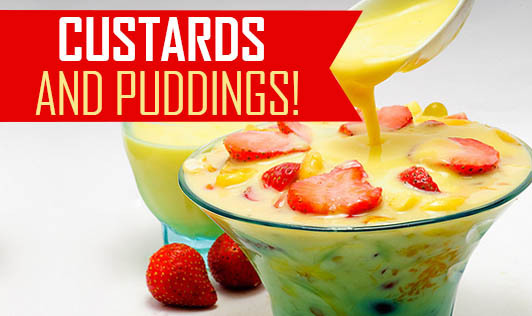 Here are some healthy and delicious custard and pudding recipes that you can have as desserts or snacks! • Warm ¼ cup of milk and mix custard powder. Keep aside. • Bring 1 cup of milk to boil. Add sugar and mix well. • Simmer and add custard mixture. Stir continuously till the custard thickens and let it cool. • Mix chopped fruits in a bowl and keep aside. • In a bowl, place a layer of chopped fruits. Spread custard evenly on top of it. Repeat this for 2-3 layers and refrigerate for 30 minutes. • While serving, garnish with chopped nuts. • Tear the bread slices into big pieces and place a layer of it in a bowl. • Spread a layer of custard on the bread and sprinkle coffee powder. • Repeat this for 2-3 layers and refrigerate for 30 minutes. • Add sugar to fresh cream and mix well till sugar dissolves. • Break marie biscuits into 4-6 pieces. • In a bowl, place the marie biscuit pieces in a layer. Spread a layer of cut fruits and pour 1-2 tbsp of cream. • Repeat this for 3-4 layers and refrigerate for 30-40 minutes. • Garnish with dry fruits and serve chilled.